As shown by the title of the post, we drove up to Manhattan Beach which happens to be only 20 minutes away from our home. We feel so fortunate to live so close to it! First up was Noah's Bagels. I have always heard about how delicious their bagels are but never had the chance to drop by. Well, Greg happened to be really hungry so as soon as we arrived at Manhattan, we went into Noah's to fuel up before our first activity. Greg got himself a ham sandwich with bagel thins instead of regular bagels. (He prefers a reasonable amount of bread as opposed to too much bread). Oh my goodness!!!! This was one of the tastiest sandwiches we've had in a long time! (I tried a bite) Who knew that a cold cut sandwich could be "better" than the norm? :P Their bagels seem to live up to the hype and I cannot wait to buy some in the future. I had lunch before we left the house so I snacked on grapes and bought a hot cup of coffee. 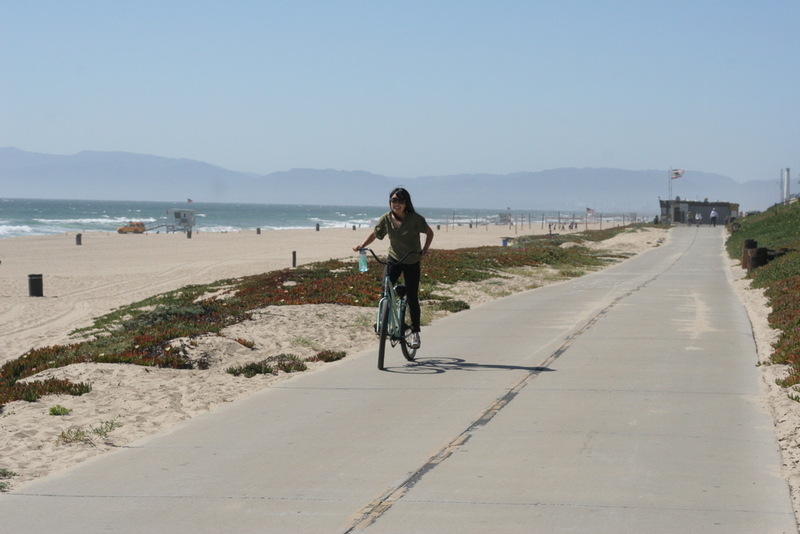 For years we've been talking about biking down the beach area and we finally did just that. It was so so fun to stroll down the path with the wind beating on our hair. What was also enjoyable (and excruciating) was biking up the San Francisco-esque hills. I was glad that we got those hills though, because we didn't have a chance to exercise before we left home. I'm learning that sometimes it's best to let fun activities do the fitness job in my life. Later on we took a walk through the city and sort of eye shopped. Then, we found a bunch of positive reviews on Yelp for Pisces Sushi which is located really close to the beach. Much to our surprise, Pisces is a quaint little shop with only 4 little seats by the window! If one didn't know anything about this place and about their awesome food, then I'm certain that he or she would walk right out the door because it seems so deserted at times. I ordered the Rainbow Roll because I truly enjoy the taste of fresh fish paired with avocado. Mmm! ;) The portion was surprisingly large compared to those of most other sushi restaurants. Greg had the Spicy Tuna Crunch Roll and it was to die for as well! On the side, we shared a Spicy Ramen. In the words of Shaun-T, I feel like screaming that aloud each time I follow his workouts. So far I've only done it 4 or 5 times and each time I tried a new DVD. I have to admit that I constantly find myself stopping for a short breather because it is so intense. Not only are the exercises heavy on the cardio and plyo, but the fact that I try to keep up with Shaun-T's pace nearly kills me. I find that each time I give his DVDs a try, I get stronger and my heart can handle more cardio when I run! 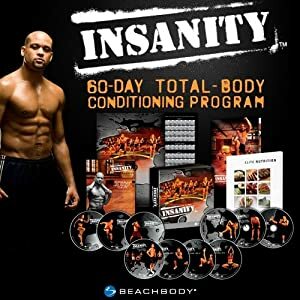 Have you tried Insanity? Would you ever want to? What new thing have you been adding to your fitness? What fun and leisurely physical activity do you like? Are you often surprised by the amazing food you find in unexpected places?